A lovingly restored, harbour-front fisherman’s cottage with superb sea views and beach access. Authentic in spirit, but reassuringly contemporary in terms of comfort, Hiera offers guests the perfect base from which to explore one of Italy’s most fascinating but least visited islands: a pebble’s throw from the beach, a gentle meander to a series of excellent trattorie, and a short stroll from the start of the walking paths that circumnavigate and scale Marettimo’s mountainous interior. If you’re in need of a rest after all that exploring, you can relax in Hiera’s al fresco roof-top tub, looking out to sea and counting your blessings. Inside: the front door takes one into the living area. Heading straight on is a shower room and then the charming kitchen-diner, whose views take in the old port of Marettimo and the sea. The kitchen door accesses the seafront footpath that runs in front of the property and, from there, the pebbly beach below. Back in the living area, a bespoke staircase leads to the first floor, which is home to a children’s twin bedroom, a bathroom with tub, and a spacious, double-aspect double bedroom. Those sleeping in this latter room are treated to superb sea views on waking - be warned: getting up to make the morning coffee will take considerable effort! Outside: when you’re not sleeping, swimming in the sea, walking in the mountains or dining on lobster soup in one of the town’s trattoria, you’ll probably find yourself gravitating towards your wonderful roof-top terrace. Here, blessed with stunning views of the sea, the mountains, the castle at Punta Troia, and the islands of Favignana and Levanzo on the horizon, you’ll be able to fully relax in the al fresco tub, catch some rays, cool off under the outdoor shower, and dine long into the night under the stars. Hiera is a great option for those who do not wish to hire a car. Indeed, Marettimo is virtually road and car-free. Hiera is very much part of the village and is within an easy stroll of shops, cafés (one of which is just behind the house) and trattorie. It is a fantastic opportunity to become part of a welcoming and fascinating community - find out more about the islanders' curious relationship with Alaska, salmon-fishing and Monterrey, California. The café-bar behind the house (open from mid-May to mid-September) is a popular spot and a good place for snacks and refreshments, from breakfast to sunset aperitifs and beyond - in the high summer months, especially around the middle of August, it stays open until late. A stay at Hiera would not be complete without a day or two spent on a boat exploring not only the bays and sea caves of Marettimo itself, but also the neighbouring islands of Favignana and Levanzo, and Trapani on the mainland. Boat hire is generally easy to arrange, even in August. Marettimo is also a great destination for hikers, thanks to a series of spectacular and well-signposted paths along the coast and high in the mountains. The roof terrace is partly overlooked by a couple of other properties. Marettimo is the westernmost of the three Egadi Islands, a 1hr10-1hr20 hydrofoil ride from Trapani on Sicily’s western tip. Largely untouched by tourism, Marettimo is a real island hideaway, a quiet, sleepy place most of the year round. In the summer months, expat islanders return to see their families, a few tourists arrive and the island's only village thrums with a very gentle buzz. Sitting in a prime village position above the old harbour, Hiera is perfectly placed for exploring Marettimo’s many attractions. A pebble beach and the sea is on your doorstep, the village's shops, cafés and excellent trattoria are a lazy stroll away, and the walking trails that wind across the island's mountainous interior start from just across the road. Marettimo packs a surprising amount of history and archaeological interest for such a small, relatively remote place. The remains of a Roman military outpost, built after the First Punic War, sit next to a Norman-era church looking out over the sea, while a dramatic castle of Arab origins dominates the northeastern tip of the island (a promontory called Punta Troia). Well-marked walking paths criss-cross the island, offering unending views of heart-quickening beauty. Perhaps the best of these is to be seen from the top of Pizzo Falcone, the island's highest peak at about 500m above sea level. Marettimo's coastline is one of dramatic charm. Numerous grottoes puncture the precipitous dolomitic cliffs as they plunge into the sea, and a day or two exploring these on a boat is a fabulous experience. 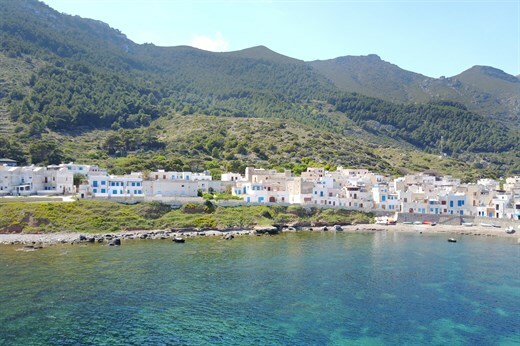 Sea lovers will also delight in the swimming, snorkelling and scuba diving opportunities Marettimo has to offer. Its waters are transparent and extremely clean, thanks to its being part of the Egadi Islands Marine Reserve (one of the largest in Europe). Should you wish to explore futher afield, a day trip to Favignana and/or Levanzo, Marettimo's sister islands, is easy enough (depending on the season and the number of hydrofoil crossings). Both have a wealth of interest, not least the cerulean blue waters of Favignana's Roman quarry coves and Levanzo's 20,000-year-old cave paintings in the Grotta del Genovese. "Hiera was paradise - our expectations were totally exceeded. Marettimo was amazing for us." Hiera was paradise - our expectations were totally exceeded. Marettimo was amazing for us. When I first saw Hiera advertised I worried it was too remote but it looked so beautiful that I took the punt. As it turned out I was very glad I did. The remoteness and unspoiled nature of Marettimo is its appeal. It is the perfect antidote to busy urban living. My wife, 12 year old son and I had a wonderful week. The house is amazing. It is right on the harbour with tranquil sea views from the kitchen, main bedroom and rooftop. We had a very short walk in the morning to buy fish straight from the fishing boats as they docked. The house is beautifully renovated with everything you need. Cooking, eating and drinking on the rooftop is a joy. The town itself is very relaxed but with plenty of good restaurants, bars, cafes, bakeries, gastronomies and supermarkets. The island is stunning and a perfect place for walking, swimming and boat trips. We were sad to leave. 5 out of 5 for Hiera. On Marettimo we particularly liked the lack of cars, the slow pace of life and the gentle hum from the Cafe Tramontana next to Hiera. The lady who looked after us was excellent. We particularly appreciated were the store cupboard of foods so that we didn’t have to buy everything.